We used some fresh Velvet Pax (Tapinella atrotomentosa or Paxillus atrotomentosus) for the workshop (see the second image below), then what I had left sat in the freezer for a few weeks. I ended up with a strong concentration of mushrooms, resulting in one of the best browns ever to come out of my dyepots (there’s a hint of purple in that brown – I swear it!). 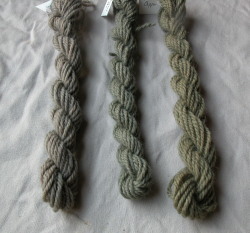 The two brown skeins were mordanted in copper, while the green were mordanted in iron. 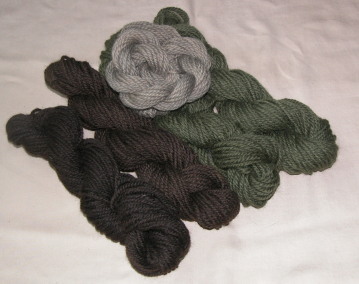 The small grey skein was mordanted in alum. After these skeins came out, I put the mushrooms back into the pot and they’ve been brewing on top of the woodstove for a few days. I have high hopes for the second exhaust, but first I need to do some more mordanting. 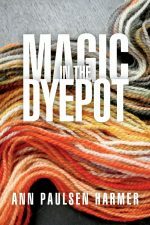 The small skeins from the workshop obviously came from a weaker dyebath; the mordants are alum, iron and copper.